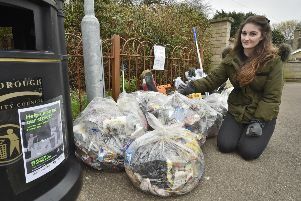 A Peterborough mother has become frustrated by her local park which has been blighted by overflowing bins. Louise Ann Gross said she has had to stop taking her two-year-old son Theo to the green space which is on the path leading from Sugar Way to the railway track, behind Boleyn Avenue. The land is privately owned and has reportedly been in a poor state for many months, although it was cleaned at the end of last week. Louise said: “We walk past the park every day with the dog and each time my toddler asks to play in there.